I don’t understand all the apparent negative emotions around this topic. It’s not the end of the world if it turns out the community can’t make good looking models or code any sensible samples. But why not let us try? It’s my own time I’m wasting after all. The problem of this topic. Principle: it is better to intelligently comment than to do as it should. This community effort idea sounds like a good idea at first, but I think the old panda3dprojects or pandaprojects (forgot the name of the site) proved that this goes nowhere when the user base is still small. As I said, this thread seems to already be producing results. It may be slow–but are we in a hurry? I’m not saying people here currently are not talented. I’m saying we, and that includes me, are not talented enough in 2d and 3d art to make better sample assets on our own. You’re assuming that everyone here is a coder, and nothing else; that none of us are artists, too. It’s not the end of the world if it turns out the community can’t make good looking models or code any sensible samples. But why not let us try? I’m inclined to agree. If it doesn’t work out, then perhaps we can look at other avenues. But right now, I don’t think that things are going poorly here. In my opinion, It would be a waste to throw money at improving the assets,as they are samples which will be replaced anyway. but because he’s a preset, Having him photo-realistic would simply mean longer loading times,larger files and would limit him to only Photo realistic environments. Far better imo. to give people the information on how to shoot,move and interact with the game world environment. The rest can be sorted once the “meat and potatoes” of the game is finalized. I don’t understand all the apparent negative emotions around this topic. Maybe because there isn’t any. I don’t know why you sensed any negative emotion from pure text, but I can speak for myself and there’s no emotion attached to my post, only constructive criticism. I’ve mentioned why I disagree and proposed a different approach I consider better, hence it’s constructive. I believe I have no emotional investment in this because I have Godot and Unity as well as Panda in my game dev arsenal, if one doesn’t evolve how I expect I always have an alternative option. It’s not the end of the world if it turns out the community can’t make good looking models or code any sensible samples. But why not let us try? It’s my own time I’m wasting after all. I don’t quite understand how I’m obstructing you from trying by just stating my opinion in text. You’re free to waste your time, as you put it. I wouldn’t say you’re wasting your time, by the way, even if your models aren’t good making new models in never a waste of time for an artist because that’s how you improve. And I don’t think it’s the “end of the world” either and I don’t know why you use such extreme words to interpret what I said. Some people are good at coding and some are good in art, sure, art is subjective but there is some level of common ground when it comes to what we consider good. And I believe stating something is not good enough isn’t bad emotions at play but just an honest response. In art forums such as Blenderartists you’ll get bombarded with harsh but constructive comments why your models need improving and how to improve them, this is not the forum or topic for it I believe. But if you really want I can provide my constructive criticism, but for a character I’ll need a 4 view render and see the wireframe first. What results are we talking about? I’ve been using Panda for 11 years and used the forum for 10. The samples have been mostly unchanged. The idea for improving the assets have been proposed several times, each time going nowhere. I just feel like we are doing the same thing again expecting different result. My opinion is that the bottom line is most programmers can’t make good enough assets and I don’t see any in this topic either, that’s all. I’m not saying I’m any better at it either. Because I’m not seeing any good art. I think that’s the most reasonable conclusion. Show me something and I’ll change my mind. The point of better assets is not to make them good enough to be reused in actual projects, the point of good looking assets in samples is same as good looking assets in the engine screenshoots: to give good first impression. This is not just a game engine thing. Go to Unity’s site, Godot’s, Blender’s or even GIMP’s, they all have good art in the front pages for a reason: to attract new users. Again, if you want to make assets, go for it, I can’t stop you, but if it doesn’t look good there’s no purely nice way to state it, sorry. @Anon Can you offer something essentially? except the idea that someone will do it for us. One does not require more work in code to set up than the other. In Panda we don’t have Prefabs out of the box, but even in Panda you can have the bump maps, normal maps, gloss maps, glow maps, etc. all set up automatically by the model loader. So unless you mean something else by complex, it shouldn’t make the code of the tutorial a single line more complex. It’s simpler to make a generic character with good materials and no texture details, this avoids to distract from attention from the tutorial. Now compare these to RoamingRalph.egg. I understanding the latter was done by a non-professional, but that is not my point. The model is not good for sure and need to be replaced.
. In 2019, you not only have much easier and novel ways to raise money but also much more in gamedev is automated and doesn’t require a single line of code from the game dev to use more “complex” models. Panda 3D can import Fbx or Collada, that’s not automated. We could say creating a scene, placing characters , assigning scripts to each characters, add trigger volumes and script, changing the scene moving objects , is also not really automated in Panda 3D without a scene editor. But as I mentioned most things are already easy to achieve since its set up by the model loader. Unless you mean things like PBR materials, SSAO, etc which I don’t think should be used either. But even without them surely you’ll agree the models can have bump mapping or at least higher res textures or better topology like in my above examples. Godot has glow maps and bump maps on models in a simple walk around and jump 3d platformer sample, it doesn’t add anything to the code to have them. Godot default lighting and material is fully pbr.This is what Panda 3D needs, Panda 3D scenes looks lot better when they use the new pipeline, it should be the default render. But the render pipeline is inactive on GitHub since long time. I gave a specific suggestion how to get better samples and even offered to donate 50 USD myself and pay around 500 USD from my own pocket to the freelancer(s) until the work is finalized and approved (that’s how Upwork works, money has to go to escrow until job is done). If that’s not good enough then sorry, there’s nothing else to offer, I see only two options: either someone donates work here as some have proposed or we hire someone else to do it for us which I offered. There’s no other way, it’s a very simple situation. It baffles me why you would ask what I can offer after this as if I haven’t offered enough or anything? That’s the point, find something simple and looking good. @Anon This topic is not for collecting money, you can buy a model and publish it here as a gift, without any additional sentences and words. This topic is not for collecting money, you can buy a model and publish it here as a gift, without any additional sentences and words. I don’t want to argue with you but I want to clear this up for others: I gave specific reasons why I think we are better off hiring an actual freelancer 3d modeller to make better assets and just offered 50 USD donation myself for that goal and also helping find the freelancer and optionally act as th intermediary with no financial gain. Sorry, I can’t afford to buy and donate 500USD worth of assets all by myself here. Even if I could, such assets for sale are not sold to one person exclusively so it would be legally problematic sharing the assets freely with the engine to anyone who downloads the engine when the original artist is still selling the asset. Secondly, it would be hard to find an “asset pack” with all of the assets needed for a tutorial or sample and using assets not from the same asset pack would look bad due to the different assets having a different look, theme and style and not intended to be used together. I don’t think you get to decide what this topic is about, but that said I’ve made my point already and have nothing to add. Secondly, it would be hard to find an “asset pack” with all of the assets needed for a tutorial or sample and using assets not from the same asset pack would look bad due to the different assets having a different look, theme and style and not intended to be used together. 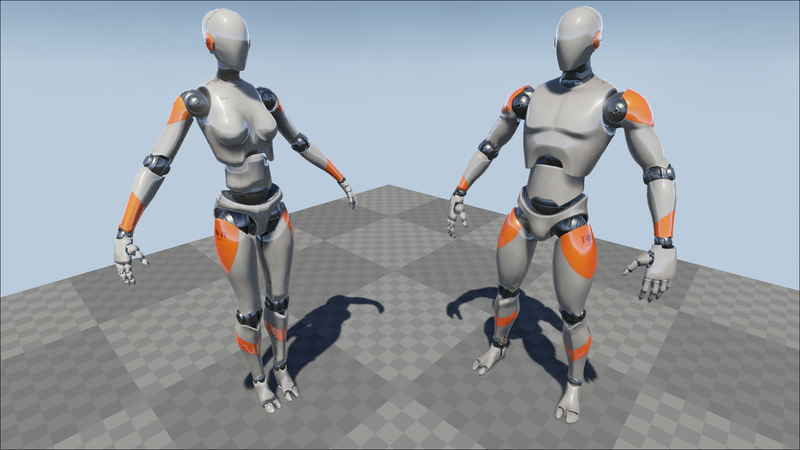 Get assets with generic materials, they will look good together. New samples for Panda3D. Contribute to wezu/p3d_samples development by creating an account on GitHub. I propose to create a special category, where the topics will be the names of the examples. And there to lead a discussion about updating the examples. The tutorial game itself is complete in function, if not in form, I believe. I have some sounds to either make or find, some re-skinning of the DirectGUI-based menus to do, perhaps some effects to add, and some modelling/texturing/animating to do–but the game itself is playable. The player can run around, zap enemies for points, dodge (or be hit by) sliding “traps”, and eventually die, with the option then of either restarting the game or quitting. There’s also a title menu, to which I may end up adding a few things. Once the game is done, my current intention is to clean up the code a bit, then divide it into step-by-step lesson-code. That in turn I intend to accompany with text, explaining what’s being done in each step. Do you mean a sub-forum specifically for such examples? If so, that’s an interesting idea. Yes, it could be constantly seen on the surface of the forum. Fair enough. I have no strong feelings on the matter either way right now, so–does anyone else have any thoughts on this? The best would be to create the same or new tutorials working with Entity system like Godot or Unity games. Some main entry that manages attaching scripts to entities and manage all entities (create,update, release functions). I don’t think it’s possible without a world editor and objects properties to attach some script to en entity, otherwise hard coding it. Revamped same old small code examples will not help, it’s just changing assets. Instead of showing how it’s made a full functional game, how scripts are attached to different objects, and how they are managed, how assets are imported , how animations are managed , how materials can be changed, how physics is setup. Panda lacks full game tutorials, with some menu, some main scene game with player and some enemies for example and how it’s all managed and created with pathfinding, physics and ai.